Public Sector Units :- In Public sector Units (PSUs) government take or holds the majority interest. In simple words, Government holds more than 50 % stake of an organisation. Now the question arises, What are nationalised Banks ? 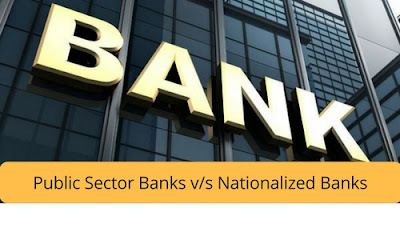 Nationalized Banks :- Before discussing Nationalized Banks, we have to know about Private Banks. So, Private Banks are those banks whose majority stake is held by an individual or may be by any private entity. So, When government buy that majority stake from that individual or private entity then that private bank will become Nationalized Bank. The major difference between both of them is that all the Nationalized Banks will become Public Banks. No Public Banks will become Nationalized Banks. On 22 June 2016, the government announced that they wanted to merge 26 banks into six big lenders. What is the need to merge banks? So, the reason behind this activity is the competition. As our government took this step of merging the public sector banks, for understanding this activity we have to understand from the beginning. If we observe the balance of the each and every bank individually then you can clearly see that our balance is very less or we can say nothing as compared to foreign banks. So, for mentioning the competition between foreign banks and public banks of India. The government decided to combine or merge the several banks. Which bank is going to be merged in other bank? These above six banks are big lenders bank. There are some banks mentioned below whom are merging with big lenders banks. Syndicate Bank, Indian Overseas Bank, UCO Bank will be merged with Canara Bank. Central Bank, Dena Bank will be merged with Union Bank. Andhra Bank, Bank of Maharashtra, Vijaya Bank will be merged with Bank of India. If these banks merge, then the capital of all these banks will also combine. This large capital helps the bank to increase the power of the bank. With this large capital, banks can easily give competition to the foreign banks. With increased capital, their balance sheet will also become more profitable. The biggest disadvantage is that if these little banks don’t merge with large banks. Then after some time there are chances that these little banks would be banished. So, for their benefits they have to join the big lenders bank.